If abiotic oil exists, where is it? Here we will survey some of the geological sites mentioned most often in support of abiotic oil. We will see if there are other, biotic, explanations for the phenomenon found at these sites. Let us remember, that in order to prove the hypothesis of abiotic oil, it is not enough simply to point at sites and say "Here we are producing oil from bedrock" or "Here the reserve is refilling mysteriously." When proving a scientific hypothesis, you must be very careful to disprove any alternative explanations. This is the onus of the abiogenic oil hypothesis. Furthermore, as Ugo Bardi has pointed out in this newsletter (Abiotic Oil: Science or Politics? ), if you insist that the standard explanation of oil formation is the result of some conspiracy, then you have already stepped outside of the realm of scientific investigation. The theory of the organic origin of oil evolved gradually and has been refined through many decades of investigation and observation. It does a superb job of explaining the observed phenomenon and predicting new discoveries, and it is consistent with the mechanics of geology. While everyone is free to form his or her own opinion, when people start talking about a conspiracy of scientists to cover up the supposed abiotic origin of oil, then all an honest scientist can do is to shrug her or his shoulders and say that he or she is not aware of any such conspiracy. In fact, such a contention makes numerous logical errors; based on the logical fallacies listed at http://www.nizkor.org/features/fallacies/index.html, I can count at least 17 errors of logic frequently made by those who argue that the biological origin of oil is a conspiracy. Such errors of logic are the province of a politician, not a scientist. One of the most notable efforts to prove the existence of abiotic hydrocarbons was undertaken by the Swedes at the urging of Thomas Gold. Dr. Gold had pointed to the Siljan meteorite impact crater as the ideal place for discovering hydrocarbon seepage from the mantle. Although Dr. Gold pronounced the effort a success, as Jean Laherrere has pointed out,1 this venture could be used as the definition of a bust. From 1986 to 1992, two commercial wells were drilled in the Siljan crater, at a reported cost of over $60 million.2 Only 80 barrels of oily sludge were taken from the field. While Dr. Gold claimed this oil to have an abiotic origin, others have pointed out that the early drilling used injected oil as a lubricant, and that this is the likely origin of the oily sludge.3 It has also been mentioned that sedimentary rocks 20 kilometers away could have been the source of hydrocarbon seepage.4 Others have observed that during World War II, the Swedish blasted into the bedrock to produce caverns in order to stockpile petroleum supplies. The Swedes now face environmental problems as these petroleum stockpiles are leaking into the groundwater.5 These stockpiles could well provide the source of the oil produced from the Siljan crater. Even if we grant that these hydrocarbons are abiogenic (though it is a highly dubious claim), this exploration could only be termed a success in the most attenuated sense of the word. These 80 barrels of oily sludge cost investors three quarters of a million dollars per barrel. And if they had gone to the trouble of extracting the oil from the sludge and refining it, they would have had even less oil, and their expenses would have increased by the cost of extraction and refining. 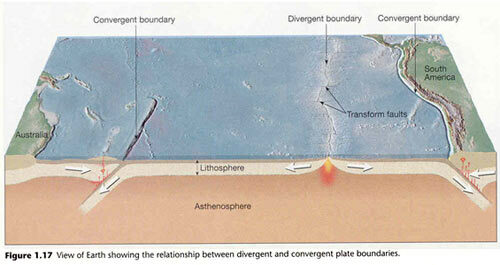 taken from Earth; an introduction to physical geology, Tarbuck & Lutgens. Prentice Hall, sixth edition, 1999. Convergent boundaries occur where subduction takes place; divergent boundaries are mid ocean ridges where new oceanic crust is formed. Note the partial melting and emplacement of magma bodies within the overriding plates. So we have recent sedimentary rocks overlying folded sedimentary rocks of Jurassic age, which are intruded by late Mesozoic granitoids, all lying atop fractured basement rocks of PreCambrian age. The area is crossed by numerous faults which have been closed and reactivated several times during various episodes of compression, extension, compaction due to differential loading of sediments, and decompaction due to backstripping of the sediments.9 Most recently, the area has formed the horst and graben topography common to pull apart basins such as the basin and range of Nevada. The resulting basins have been filled during post-rift burial phases.10 Extension halted during the Oligocene, and has been followed by the slow post-tectonic thermal cooling of the area.11 It has become tectonically deactivated. The source rock for the hydrocarbons is an algal-rich lacustrine rock which matured during the Oligocene-Miocene pull-apart basin and subsequent burial phases. Migration of the oil occurred from the Miocene to recent times, and filled the available fracture and grain space in the highly fractured basement rocks and overlying sedimentary rocks.12 The Boch Ho field is estimated to contain 1 billion barrels of oil, and is produced mainly from the intrusive granitoid plutons.13 (Jean Laherrere states that a better estimate is between 1.2 and 1.5 Gb.) The hydrocarbons are not abiotic, they originate from the lacustrine sedimentary rock. Thomas Gold and other proponents point to volcanic outgassing as evidence of abiotic hydrocarbons. While Jean Laherrere dealt with this contention more thoroughly in the first portion of this series,14 I would like to quickly reiterate his argument. First, volcanic outgassing from mud volcanoes and subduction related volcanics cannot be claimed as evidence of abiotic hydrocarbon production within the mantle. Volcanic outgassing of methane is easily explained by the tectonic model. Subducted ocean floor, along with overlying sediments rich in organic detritus, undergoes partial melting as it rides down into the asthenosphere. This partial melting explains the difference between continental (granitic) igneous rock and oceanic (basaltic) igneous rock. It also explains how organic rich sediments subducted along with ocean floor could be cooked into methane well above the mantle. In order to back the claim of abiotic outgassing, proponents must look to the mid ocean ridges, where new ocean floor basalt is created through the upwelling of the mantle. Sampling has been done along the mid ocean ridges, and while the results do suggest the production of methane and equally simple hydrocarbons from the mantle, the amount is negligible.15 More methane is produced annually from cow farts than from outgassing at the mid ocean ridges. Eugene Island is one of the darlings of abiotic theorists. Cornucopians point to Eugene Island as proof that oil reserves are mysteriously refilling. There have been many bold and unreliable claims about the amount of oil held in these reserves, and the rate of recharge. These claims fall flat upon examination. Here we will stick to reserve data as reported by the Oil & Gas Journal (OGJ) and the Minerals Management Service (MMS), two reliable sources of information. In 1978, the OGJ reported estimated reserves of 325 million barrels (Mb). The figure was increased to 388 Mb by 1998, due to the standard US practice of initially only reporting proven reserves and neglecting the probable reserves. This practice evolved due to Security and Exchange Commission rules on the reporting of oil reserves, but is a boon to US company profiles because it allows them to regularly add to their reserve numbers over time, making it appear that they are discovering more oil. Jean Laherrere has said that the noted explorer Klemme estimated 500 Mb in 1977.16 The MMS estimated reserves at 464 Mb in 1986, and at 416 Mb in 1998, which would mean that reserves declined. Production peaked in 1996 at around 30,000 barrels/day (b/d)-28,000 b/d reported in OGJ, and 33,000 b/d reported by MMS. Jean Laherrere created the following graph. 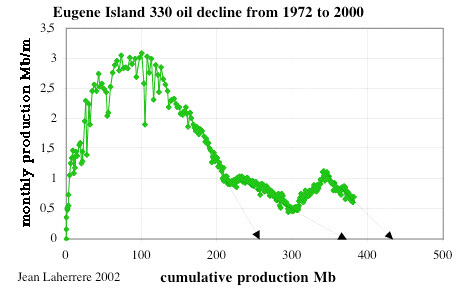 It shows monthly production in relation to total production, and demonstrates quite clearly that Eugene Island is in decline. It also shows two distinct periods of recharge, both of them minor in relation to the overall graph. That some recharge of the reservoir is occurring is not to be denied. 4D seismic studies suggest migration along Red Fault (one of the best studied faults in the world).17 But refilling is considered to be minor, reflected in a strong decline, then a slight rebound due to refilling followed by a new decline. In the early 1990's an ambitious investigation of Eugene Island was undertaken through the joint auspices of the Global Basins Research Network, the Department of Energy and the oil industry.18 The purpose of the project was to develop new technologies to extract hydrocarbons from the streams which feed reservoirs instead of merely draining the reservoirs themselves, or to enhance the streams so that they will better feed the reservoirs. The study focused on Eugene Island and on the Gulf of Mexico in general because newly migrating hydrocarbons were well documented in this region, and migration approached rates of extraction. The project first had to determine the pathway of the migrating hydrocarbons and their origin. Anderson, et al., concludes that a conservative estimate might place undiscovered hydrocarbons in the Northern Gulf at 20 billion barrels. The report suggests that a concerted effort to explore the entire U.S. Gulf of Mexico for similarly situated reserves might result in the discovery of greater than 50 billion barrels of unrecovered hydrocarbons. There is no doubt that the hydrocarbons of Eugene Island are of organic origin. The recharging of Eugene Island reserves is simply the result of complicated geological structure. Proponents of abiotic oil like to point out that although Russia's oil production peaked in 1987, their output has increased tremendously over the past several years. 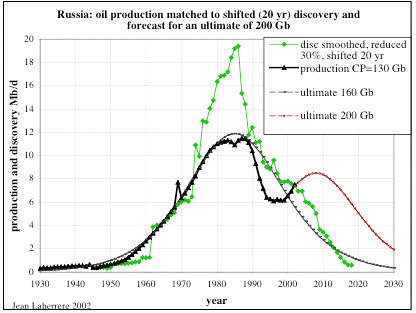 They link this to the Russian development of the abiotic oil hypothesis, which is held by a small minority of Russian scientists, to claim that Russia's production is growing because of abiotic oil. This is nonsense. In the first place, Russian oil production dropped precipitously in the early 1990s following the collapse of the Soviet Union. The current surge in oil production is in large part due to the revival of the Russian oil industry. Oil is just about the only thing currently holding up the Russian economy. They are overproducing their oil fields and, as we have said numerous times, this overproduction will catch up with them. Russian discovery peaked in 1960, and has since diminished to almost nothing. Colin Campbell's model suggested a secondary peak around 2010, followed by another steep decline due to overproduction.21 However, it now appears the Russian production is already approaching its second peak. impose it over the graph of production. The Moscow News has reported that Yuri Shafranik, the head of the Russian Union of Oil and Gas Producers, stated on November 9th 2004 that Russia has almost reached its maximum production and the decline will start within two years. Mr. Shafranik referred to experts from the International Energy Agency.22 The Moscow News also recently reported that Russian oil producers have cut back on drilling. Production drilling fell by 3.4% in the first nine months of 2004, while exploratory drilling fell by 20.6%.23 Such a large drop in exploratory drilling could indicate that investors see a trend of diminishing returns from further exploration. The so-called western production techniques result in a production spike with no plateau at peak, and decline rates that seldom fall below 20%. Mature Russian fields are seeing water cut oscillating between 60% and 90%. Just this year (2004), Yukos, Sibneft and Rosneft have all announced plans to cut production. According to Finam, Yukos faces big problems due to declining production.25 And they will likely be only the first Russian oil company to feel the pinch. From this discussion, it can be seen that Russian oil production is no miracle of abiotic oil. It is entirely due to capital investment and the switch to aggressive recovery techniques. And the Russian oil industry will pay a heavy price for overproduction. Most abiotic supporters point to the Dneiper-Donets basin as the major support for their argument. The basis for these claims rests upon a paper delivered before a symposium in 1994, authored by V.A. Krayushkin, J.F. Kenney and others, "Recent applications of the modern theory of abiogenic hydrocarbon origins: drilling and development of oil and gas fields in the Dneiper-Donetsk basin. "26 While Dr. Krayushkin appears to avoid any debate with skeptics, Dr. Kenney has been most vociferous in his attacks upon the biological theory of oil generation. The authors of this study claim that the Dneiper-Donetsk basin was chosen as the area for their study because it had already been deemed to possess no potential for petroleum production.27 However, the authors did not mention that the Dneiper-Donetsk basin is the home to most of Ukraine's proven oil reserves, and has been the focus of traditional oil exploration within the country for some years.28 The report claims the discovery of abiotic reserves totaling some 8,200 million metric tons of oil, or about 60 billion barrels of oil.29 There are many conflicting reports on the estimated reserves of Ukraine, and inconsistencies related to the Krayushkin study only complicate matters (see note 26 below). 1.4 Gb is sizable enough to have drawn the attention of the majors. Yet the only major to take an interest in the region is BP, which plans to set up a joint venture in Dneiper-Donetsk basin to develop gas reserves. Several smaller players are also setting up ventures to produce gas reserves.34 No mention of oil. Regal Petroleum Plc. is a small British company which listed on the London Stock Exchange in September of 2002. The core business of the company is production of oil and gas in the Ukraine's Dneiper-Donetsk basin. Regal is the first western company to be officially registered as an oil and gas producer in the Ukraine by the Ukraine oil department. Regal Petroleum's operations in the Ukraine are totally geared toward gas production. On their website, they estimate that their licensed areas of the Dneiper-Donetsk basin contain an estimated 25 billion cubic metres of proven and probable gas reserves, along with 5.8 million cubic metres of gas condensate reserves.35 Nowhere does the company mention the existence of or exploration for oil reserves in the Dneiper-Donetsk basin. In the USGS World Petroleum Assessment 2000, geologist G.F. Ulmishek states that the Dneiper-Donetsk hydrocarbons have been classified into two oil families, which have their source in two different rock suites in the Upper Devonian and Lower Carboniferous sections. The Lower Carboniferous source rocks are Visean organic rich marls and shales. The Devonian source rocks, which occur much deeper, are organic rich marine anoxic shales similar to the shales of the Pripyat basin. The source rocks are largely overmature throughout the basin where they dip below the oil window, though they are mature in marginal areas where they reside within the oil window.36 This explains why most of the hydrocarbons in the basin are in the form of gas. 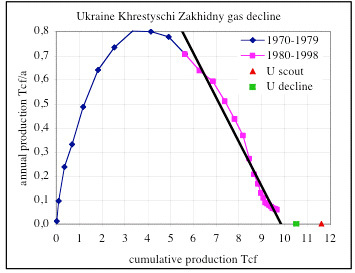 One of the few companies producing oil in the Ukraine, Naftogaz, reported that oil production declined by 5% during the first quarter of 1999, partially attributing this to declining oil deposits.37 The EIA states that production has been relatively flat since independence from the Soviet Union.38 Jean Lahererre has analyzed the available data on the second largest gas field in the Dneiper-Donetsk basin, Khrestyshchi-Zakhidny, and states that it does not show any sign of refilling from an abiotic source.39 He produced the following graph which illustrates that this field is declining naturally with time. This graph maps yearly production in relation to cumulative production. From this review, it would seem that neither the industry nor the scientific agencies have placed much credence in the Krayushkin study. The hydrocarbons of the Dneiper-Donetsk basin have been firmly established to be of organic origin. Other questionable fields could be surveyed here, but for considerations of length. Suffice it to say that a sound argument for organic origin can be built for all other examples. The fields surveyed here constitute the core examples repeatedly adduced by abiotic adherents. And we have found ample evidence that none of these plays are of abiotic origin. As for volcanic outgassing, that too is explained by organic chemistry in conjunction with plate tectonics. The abiotic hypothesis remains just that, an hypothesis which has failed in prediction and so cannot be elevated to a theory. It is completely ignored by the oil industry worldwide, and even within Russia. And that is the final testament to its failure. 1 No Free Lunch, Part 1; A discussion of the writings of Thomas Gold, Laherrere, Jean. From The Wilderness. 6 Op. Cit. See note 2. 10 Op. Cit. See note 8. 11 Op. Cit. See note 9. 12 Op. Cit. See note 8. 14 Op. Cit. See note 1. 15 Geologic emissions of methane to the atmosphere, Etiope, G. & Klusman, R.W. Chemosphere 49, pp. 111-189, Elsevier, 2002. 24 Back to Earth, Loukashova, Marina. Finam Investment Company Special Report, 8/17/2004. 26 Recent applications of the modern theory of abiogenic hydrocarbon origins: drilling and development of oil and gas fields in the Dneiper-Donetsk basin, Krayushkin, V.S., et al. Proc. 7th Int. Symp. on the Observation of the Continental Crust through Drilling, Santa Fe, New Mexico, USA, DOSECC, 1994. pp. 21-24. It would appear that either Kenney has drastically misquoted the original paper, or the paper has since been changed. 29 Op. Cit. See note 25. 30 Op. Cit. See note 27. 37 Op. Cit. See note 33. 38 Op. Cit. See note 27. 39 Jean Lahererre, personal communication, 2004.